Ten teams remain unbeaten as we enter Week 5 in Eight-Man, Division I. In fact, all of the eight districts have at least one unbeaten team except for District 6 where only South Central has a winning record at 3-1. Defending champion Central Plains is not one of the remaining unbeaten. The Oilers lost at 8M-II defending champion Victoria 16-12 to open up the season. In that game, Central Plains struggled to find a primary receiving target for all-state quarterback Braedan Crites. All-state receiver Layne Bieberlie graduated in 2014. Since then, Bryce Miller and Alex Barton have put up solid receiving numbers, but the Oilers haven’t been tested in those three wins. They have a difficult district that includes No. 3 Solomon and a solid Little River team. Finally, St. Francis and Logan-Palco are unbeaten in District 8. The Indians haven’t reached the playoffs since 2009 in St. Francis’ days as a consistent 2-1A contender. On the east side of the bracket, Hanover continues to play at a high level despite returning only two defensive starters from last season’s state runner-up finish. The No. 4 Wildcats have a district test at unbeaten Mankato-Rock Hills this week. Fifth-ranked Burlingame, Uniontown , and West Elk round out the teams without a loss on the east side of the state. Uniontown (4-0) – Uniontown has been building momentum under Chad Stroud for a few years, but injuries have slowed their success. The Eagles are off to an impressive 4-0 start having posted three shutouts. John Reed has rushed for 402 yards and nine touchdowns on the season. The line has a lot of size led by seniors Zach Schwalm (6-5, 250) and Tyler Johns (6-6, 270). Marmaton Valley (3-1) – The Wildcats will try and reach the playoffs for the first time since 2012 under second-year coach Justin Hurley. Marmaton Valley’s Austin Deer and Keagan Boyd have rushed for 358 yards and 302 yards, respectively. Deer has already rushed for 10 touchdowns on the season. St. Paul (3-1) – After a competitive 70-48 loss to West Elk to open the season, St. Paul has reeled off three straight wins over Three Rivers League rivals. The Indian offense has produced 47 points per game, while allowing 26.5 points. St. Paul is seeking its first playoff appearance since 2010. Marais des Cygnes Valley (2-2) – The Trojans have a sound nucleus from last year’s 8-3 playoff team. Quarterback Christian Cannon returns to lead the offense. Marquiese Mitchell and Cody Patterson are forces on the lines. MdCV doesn’t have much depth; however, so the Trojans must stay healthy. Waverly (2-2) – The transfer Dantn Kistner to Hartford hurt the Bulldogs, but Waverly has solid wins over Southern Coffey County and Lebo. The Bulldogs are scoring 34 points per game, while giving up 40. Pleasanton (1-3) – The Blu-Jays mounted a big rally only to fall just short of Chetopa in a 46-44 loss in Week 3. Defense is the question mark for Pleasanton. The Blu-Jays are giving up an average of 53.6 points per game and that includes their 60-0 shutout victory over Altoona-Midway. West Elk (4-0) – Much has been made about D-1 recruit Isaiahh Loudermilk and with good reason. Loudermilk has registered 34 tackles and two sacks through the first four games. Armando Gomez is healthy and returning to his all-state form of 2013. Gomez has 640 rush yards and 15 touchdowns through four games. Sophomore quarterback Cade Miller has added 486 rushing yards and eight scores for the Patriots. Central Burden (3-1) – One of the surprise teams through four weeks, the Raiders are off to a solid 3-1 start under former Cheylin Coach Anthony Blair. Despite a blowout loss to Argonia-Attica, the Raiders have posted solid wins over Caldwell and South Haven. The Raider offense is led by seniors Lucas McMichael and Josh Koppelmann. Sedan (3-1) – After a season-opening loss to No. 3 Argonia-Attica, Sedan has rattled off three consecutive wins over South Haven, Marmaton Valley, and Pleasanton. Hunter Padgett and Huntur Cummings will be key if the Blue Devils are to make the playoffs for the first time since 2009. Cedar Vale-Dexter (3-1) – The Spartans have lost and won by eight points in consecutive weeks. Cedar Vale-Dexter must be more consistent on the defensive side of the ball. The Spartans have surrendered 170 points in the past three weeks; 60 to Argonia-Attica, 60 to South Haven, and 50 to Caldwell. Udall (2-2) – Udall was ranked in the top five in the preseason polls; however, the Eagles have alternated wins and losses through four weeks. Nolan Williams has passed for 664 yards and nine touchdowns and rushed for 497 yards and seven scores. Dalton Loos, a 2,000-yard rusher for his career, suffered a knee injury in Week 2 and has missed the past two games. Loos may return soon as the injury is not as serious as initially believed. Oxford (1-3) – Oxford got its first win of the season last week in a 62-14 rout of Flinthills. The Wildcats have given up 44, 54, and 56 points in the first three weeks of the season. Key games: All games will be important in a fairly wide-open district. Udall RB Dalton Loos’ status could swing the district. Burlingame (4-0) – Burlingame has opened with impressive wins over Hartford, MdCV, Frankfort, and Waverly…all teams that will challenge for a playoff spot. The Bearcats are led by senior Robert Hutchins who has rushed for 439 yards and nine scores. Sophomore quarterback Dalton Sporing has passed for 599 yards and 10 touchdowns, and rushed for 285 more yards and seven scores. Rural Vista (3-1) – After going 5-4 in their initial season a year ago, the Heat return six starters on each side of the ball. They’ve opened with dominant wins over Little River and Goessel before a 68-20 loss to No. 3 Solomon. Coach Jeff Hostetter has a team that appears read to contend. Peabody-Burns (2-2) – Peabody-Burns has dropped two straight games to good teams in Little River and No. 3 Solomon. While the Warriors are breaking in a new quarterback in Austin Reynolds, Clayton Philpott continues to be a force out of the backfield. The Warriors have reached the playoffs in each of the past three seasons. Lebo (1-3) – Lebo is off to a 1-3 start but have lost to some quality teams in Marais des Cygnes Valley, Waverly, and West Elk. For the Wolves to compete in this district, they’ll have to be better on defense where they have surrendered 44.5 points per game. Madison (1-3) – Terry Flannigan was greeted with a difficult first couple of games in his time at Madison. The Bulldogs opened with top-ranked Spearville and then fell 44-14 to unbeaten Uniontown. The loss of all-state player Tylen Coe to transfer over the summer hurt the offense, but Madison has scored 110 points in their past two games. Flinthills (0-4) – Flinthills has now lost ten straight games and 18 of their past 20. The Mustangs gave up 48 points in their first three games before surrendering 62 last week. Mankato-Rock Hills (4-0, 2-0 district) – The Grizzlies have quietly opened 4-0 with a total score of 170-90. Rock Hills was 5-4 last season behind an offense that averaged 44.2 points a contest and a defense that permitted 41.3. This season, Rock Hills has allowed 22.5 a game. Senior Spencer Callaway has completed 32 of 54 passes for 553 yards with a 9/1 TD/INT ratio. He has rushed 51 times for 403 yards and nine scores. The defense has already forced 15 turnovers after just 19 all last season. Hanover (4-0, 1-0 district) – Perhaps one of Kansas’ biggest surprises is how well Hanover has come back after returning zero offensive and two defensive starters back from the Eight-Man, Division I runner-up squad in 2014. Hanover has outscored teams 216-52. The Wildcats averaged 58 points a contest and scored 754 total points, seven off the eight-man record. This season, the Wildcats are at 54 a game behind a prolific passing offense that has produced 294 yards a game. Junior Will Bruna, in the first three games, completed 52 of 69 passes for 881 yards with 14 scores against one interception. Lincoln (3-1, 1-1 district) – Lincoln, behind all-state senior quarterback Zac Walter, won its first three games before a district loss to Osborne last week. Lincoln had scored 164 points in the first three games before the 34-18 road defeat. Osborne (2-2, 1-1 district) – The Bulldogs, 13-0 and 10-2 the last two years, have gone from elite to solid after coach Steve Tiernan and his son, all-state senior quarterback Jake, left for Solomon. Junior Cullen Grabast has 807 all-purpose yards and 10 scores, including 109 carries for 595 yards and six TDs. Clifton-Clyde (2-2, 1-1 district) – Clifton-Clyde went 1-8 last season and has already bettered its win total this year. The Eagles have outscored teams 174-106. Last season, opponents outscored Clifton-Clyde 396-140. Lakeside-Downs (0-4, 0-1 district) – The Knights have lost 10 straight contests after a 3-0 loss in 2014. Opponents have outscored Lakeside 234-66. Wakefield (1-3, 0-2 district) – The Bombers had high expectations and a top-5 ranking entering the season, but face a big uphill climb after a Week 2 non-district loss to Solomon and district defeats against Hanover and Rock Hills. Senior all-state running back Zack Melius has missed significant time with injury. Solomon (4-0) – With the addition of Coach Steve Tiernan and quarterback Jake Tiernan, Solomon may be ready to challenge Central Plains for the district and state title. The younger Tiernan has passed for 542 yards and 11 scores with Kord Hilbert and Cain Fowles being targeted the most. Hilbert has rushed for 300 yards and seven scores, while Zach Neilson has rushed for 274 yards and five scores. Central Plains (3-1) – The defending champion Oilers have responded from a Week 1 loss to Victoria by posting shutouts of 66-0, 74-0, and 62-0 over the bottom teams in the Central Prairie League. Their competition will get stronger in this district. Braedan Crites has thrown for 274 yards and seven touchdowns, while Jacob Warnken has rushed for 146 yards and seven scores. Ellinwood (3-1) – Ellinwood has posted three shutout wins over winless teams in St. John, Kinsley, and Macksville. Jordan Duvall makes the Eagle offense go as he’s rushed for 502 yards and eight touchdowns in four games. Quarterback Tyson Martinez has passed for 359 yards, rushed for 177 yards, and accounted for ten total touchdowns. Little River (3-1) – After a shutout loss to Rural Vista to open the season, Little River has ran off three straight wins over Centre, Peabody-Burns, and Udall. Quarterback Clay Zeller has thrown for 357 yards and five scores while rushing for 230 yards and four more touchdowns. Levi Swenson has scored five rushing touchdowns to lead the Redskins. Goessel (2-2) – Goessel appears to be much improved under Garrett Hiebert. The Bluebirds opened with a 6-point loss against consistent contender Peabody-Burns before being beaten badly at Rural Vista. Goessel responded with close wins over Centre and Sylvan-Lucas. Miguel Guerrero has 314 rush yards and six scores, while Josh Schmidt has added 288 rush and four scores. Canton-Galva (1-3) – Dustin Patee’s team has lost two games by a total of 16 points. The Eagles have been led on the ground by sophomore Dylan Wood’s 289 rush yards and three scores. Senior Travis Unruh has added 236 yards rushing and three touchdowns. Sophomore Jonah Sargent has passed for 221 yards and five scores. South Central (3-1) – South Central has been one of the more consistent programs over the past three seasons. The Timberwolves have posted a 17-7 record since the beginning of the 2013 season. Their only blemish this season was a 52-6 loss to top-ranked Spearville in Week 2. Junior quarterback Gerald Morehead is putting together a great season having rushed for 606 yards and ten touchdowns and thrown for 271 more yards and five scores. Cole Lohrding has added 335 yards rushing and four touchdowns. Kiowa County (1-3) – Kiowa County has played a tough schedule to open the season. The Mavericks have losses to Hodgeman County, Ashland, and Spearville with a win over Minneola. All four of those teams should make the playoffs in their respective divisions. Kiowa County has a big veteran line in four-year starters Erik Torres (6-0, 276) and Aaron Heft (6-0, 289). Dylan Jacks leads the Mavs in rushing with more than 325 yards and five scores. Kinsley (0-4) -- Kinsley has been shutout in all four games this season. Their opponents have been good; a combined 12-4 record to date, but with only three seniors it looks to be a tough year for Kinsley. The Coyotes haven’t made the playoffs since a stretch of four straight appearances from 1990-93. Macksville (0-4) – Once a perennial playoff contender, Macksville is stuck in the middle of an 18-game losing streak. The Mustangs have been shut out three times this season, having scored all 20 of their points against Ness City in Week 2. Pratt-Skyline (0-4) – After reaching the playoffs for the first time in 15 years, Skyline lost a big senior class from 2014’s team. The T-Birds have struggled this season scoring only 22 total points while being shut out three times. Juniors Andrew Withers and Justin Hampel have been the primary ball carriers along with senior Brady McComb. St. John (0-4) – Struggling with number, St. John’s schedule hasn’t done the Tigers any favors thus far. The Tigers’ opponents have a combined 14-2 record and include ranked teams in Central Plains (8M-I), Victoria, and Otis-Bison (8M-II). Hodgeman County (4-0) — The Longhorns, outside of the top-five in the preseason, has again emerged as another elite team. Hodgeman County has won each game by at least 36 points and permitted just 20 points this season. 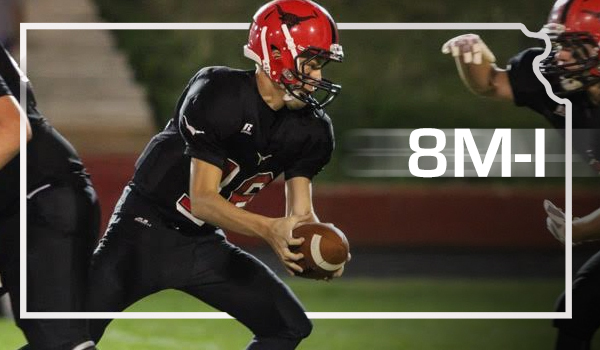 Sophomore quarterback Jacob Salmans has completed 21 of 30 passes for 599 yards with 10 TDs against no interceptions. Junior Carson Cohoon has 34 tackles, 11 for loss. Spearville (4-0) — The Lancers have been No. 1 in the classification virtually all season behind experienced veterans, including senior quarterback Nathan Stein. The Lancers have rushed for 225 yards a game and passed for 68. Stein has 554 total yards and nine scores. The Lancers have always kept their turnovers low and have yet to have a turnover this season. Spearville has outscored opponents 208-18. Dighton-Healy (3-1) — The Hornets have enjoyed a great passing attack with 147 yards a contest. Juniors Tyler Lingg and Dylan Foos have completed 44 of 73 passes for 589 yards for 15 scores against two interceptions. Dighton-Healy has already matched last season’s victory total from a 3-6 season. Ness City (3-1) — Coach Marc Cowles, the longtime coach at Weskan, took over for Chris Bamberger this season when Bamberger went to Lakin. Ness City has two blowout wins followed by big losses to Otis-Bison and Victoria. Senior quarterback Dylan Hamilton leads the offense. WaKeeney-Trego (3-1) — The Golden Eagles, after a 2-7 season in 2014, have opened 3-1 with road wins against Stockton and Hill City by scores of 52-22 and 20-14, respectively. After a 60-14 loss to Wallace County in Week 3, the Golden Eagles defeated Thunder Ridge, 54-8, last week. Cedric Flax and Corbin Schoenthaler have emerged as the top players. Flax leads the team with 600 rushing yards and 10 scores, and Schoenthaler has 292 rushing yards and six TDs. South Gray (1-3) — The Rebels have three shutout losses and a Week 3 50-0 victory at Fowler. Opponents have outscored opponents, 148-58. St. Francis (4-0, 2-0 district) – St. Francis has three shutouts, including a 24-0 victory against Triplains-Brewster (3-1) in Week 1. The Indians scored a key district victory in Week 3 with a 38-34 win against Oberlin. St. Francis is now 9-4 since switching to eight man two years ago. Logan-Palco (4-0, 1-0 district) - The Trojans are quietly unbeaten under first-year coach Mike Jenner and are now 13-9 since the schools formed a co-operative agreement in football. Logan-Palco beat Stockton 18-12 in overtime in Week 3, and won 62-28 at rival Northern Valley last week. Atwood-Rawlins Co. (3-1, 1-0 district) – Atwood opened with a 36-14 loss versus Wallace County before wins at Dighto-Healy, at Northern Valley, and home with Hill City by scores of 44-32, 50-0 and 48-0. Junior Cole Sramek has 41 carries for 348 yards and six scores. Oberlin-Decatur Comm. (2-2, 1-1 district) - Oberlin opened the season with a 36-28 home victory against Hoxie, then lost at Wallace County and St. Francis the last two weeks by 52-6 and 38-34 scores, respectively. Oberlin won at Stockton, 50-34, last week. Hill City (1-3, 1-1 district) - The Ringnecks opened the season with a 40-12 loss at Beloit/St. John’s-Tipton and a 20-14 defeat against WaKeeney-Trego in Week 2. Junior Gabe Hamel has 67 rushes for 388 yards with three TDs. Quinter (0-4, 0-2 district) - The Bulldogs are in for a rough year with little experience and very few numbers with just an 11-player roster. Quinter has yet to score in 2015. Stockton (0-4, 0-2 district) – Stockton has been more competitive this season, including a 28-20 road loss to Thunder Ridge in Week 2, an 18-12 overtime loss to Logan-Palco in Week 3, and a 50-34 home loss to Oberlin last week. The Tigers have lost 21 straight contests dating back to a 30-24 victory at Hill City in Week 1 of the 2013 season. Key Games: While Logan-Palco and Oberlin are solid teams, the Week 5 contest of Atwood at St. Francis will likely decide both spots.